Another save the date - the NY Cake Convention is coming up! Cakespy is one of their sponsors and, I believe I recognize, artists, though I don't want to make that definitive claim just yet. it really takes to turn your dream into a real­ity. Lis­ten as guest speak­ers pro­vide you with the infor­ma­tion you need to get your start in the busi­ness. They will cover all the nec­es­sary steps and infor­ma­tion that you need to launch your own cup­cake or cake busi­ness. The lec­ture will pro­vide you with infor­ma­tion on com­plet­ing a busi­ness plan, start­ing your busi­ness with lit­tle funds, var­i­ous ways to raise cap­i­tal for your busi­ness, dif­fer­ent kinds of insur­ance you will need, apply­ing for SBA backed loans, pro­duc­tion sched­ules, pric­ing, get­ting press cov­er­age, cake con­tracts and forms, avoid­ing cake deliv­ery prob­lems, effec­tive mar­ket­ing, adver­tis­ing your ser­vices and so much more. You will be given all of the tools you need to open and run a suc­cess­ful cup­cake or cake business. Space is lim­ited, reserve your seat today. 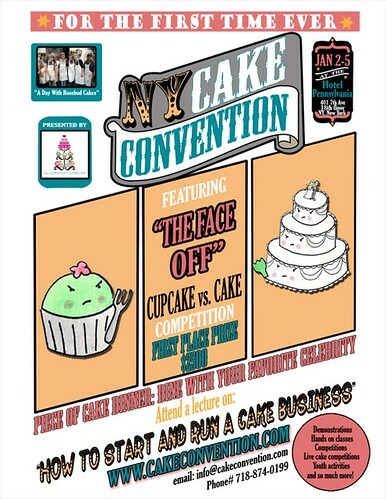 Among many of the competitions taking place at the NY Cake Convention will be the first ever “Face-Off” Cupcake vs. Cake competition. The first prize winner of the “Face-Off” will take home a cash prize of $2,500! Not to mention, bragging rights.